There are many ways in which a researcher can explore the internet for images; but, often, for academic research or to view a high resolution image online it is necessary to go beyond a basic Google search. ARTstor is one academic tool that can help you find quality digital reproductions of over a million images in the arts, architecture, humanities and social sciences. ARTstor is easy to use and users only need to create an account in order to use the site. 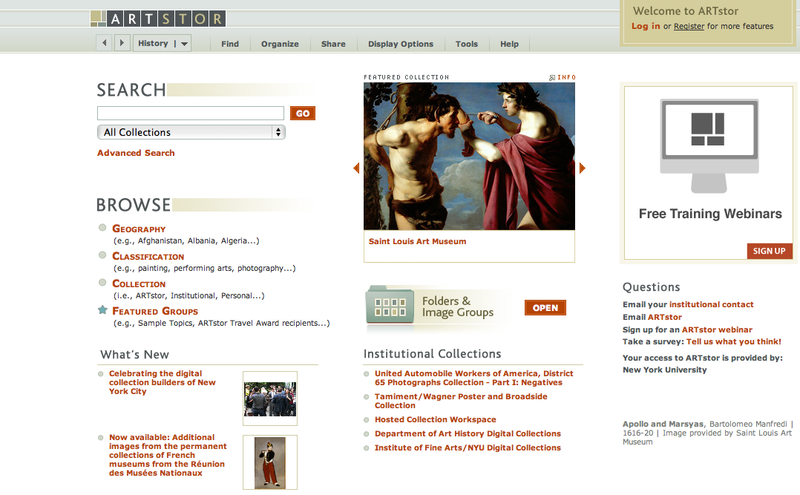 Often, college students are able to access ARTstor’s database through an agreement with their school and the website. 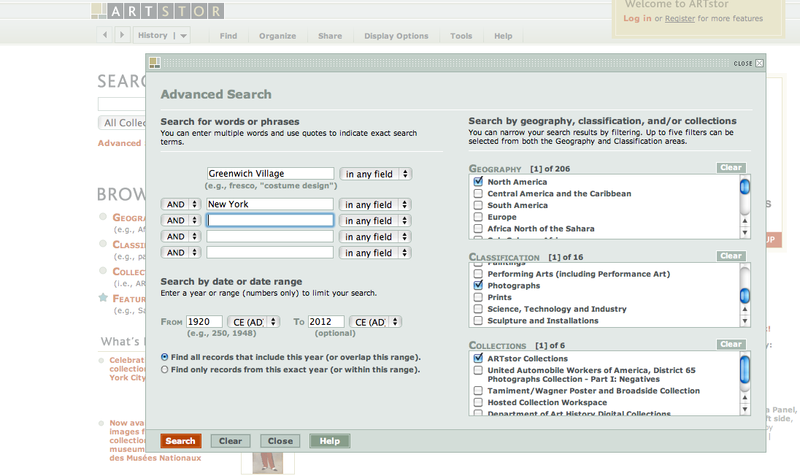 So, let’s perform a basic search using ARTstor! 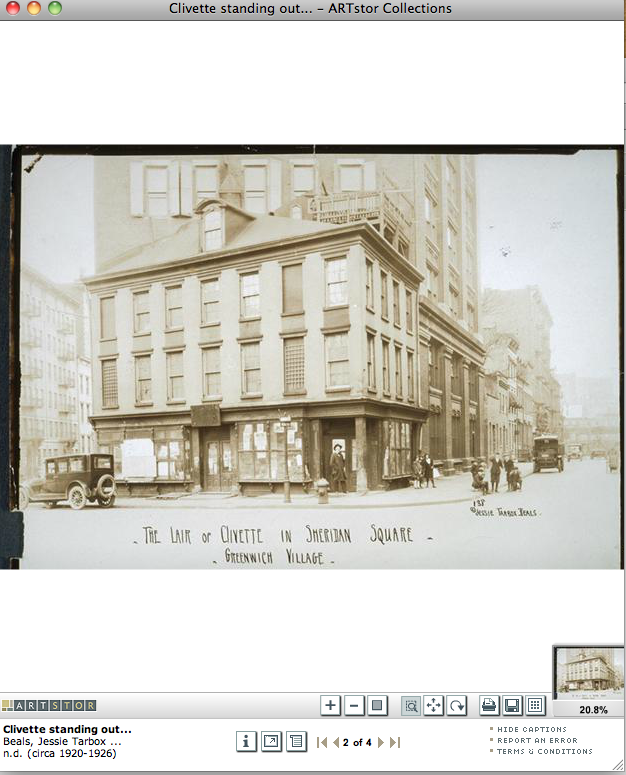 For this demonstration, let’s begin a broad search for photographs of New York City, Greenwich Village, in particular. To begin our search we can use the “Find” tab located at the top of the page. Using the “Advanced Search” option we can provide ourselves with the best chance of finding the images that we want. First, under the “Geography” option select “United States” and under “Classifications” select “Photographs.” You want to be sure to select “ARTstor Collections” under the “Collections” tab in order to ensure that you are viewing the entire ARTstor Collection and not just a special collection on the website. In some instances, narrowing your search to only a specific collection will better serve your research requirements; so, for example, if a user only wanted to search for photographs in the Tamiment/Wagner Poster and Broadside Collection selecting that under “Collections” would produce more refined results in the search. In the left portion of the “Advanced Search” field there are options to search for specific words or phrases in the description of the photograph. You can also narrow your search to include specific dates. 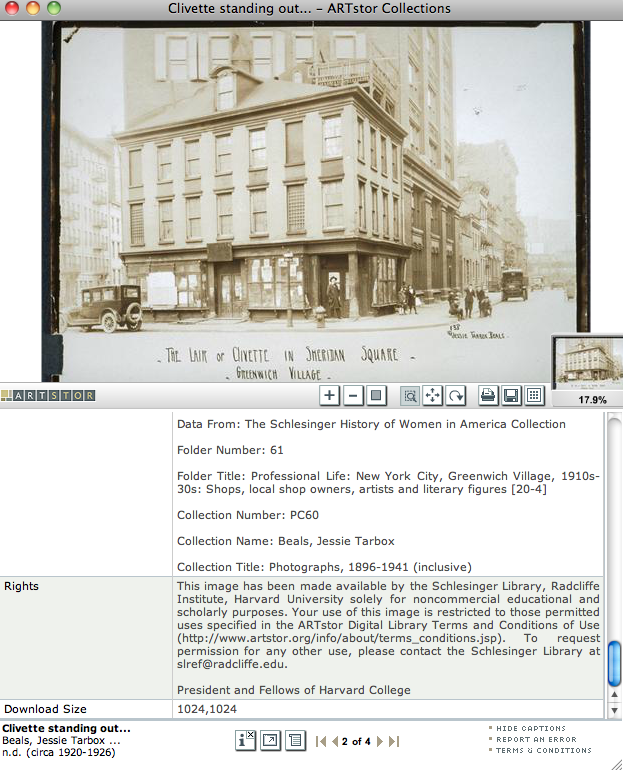 For the purposes of our search we can use the keywords “Greenwich Village” and “New York.” We can also narrow our results to photographs taken between 1920 and 2012. Users also have the option to search for images within a specific range or to only look for images in the years entered in the “Date or Date Range” section. After we’ve filled in the necessary section of the “Advanced Search” box we can select “Search” and see what images our search yielded. We got over 500 image results! To make our search more manageable we can further restrict our search. Let’s narrow our search to “Greenwich Village”, “New York”, “Buildings”, with a date range of 1920-1925. Our search has been narrowed enough that it is has now produced manageable results for our research. We can now click individual photographs and get better views of them. Also, by clicking the small “i” icon at the center of the window, we can view all of the data associated with the image. The image information includes vital data that will give the researcher details about the creator of the image, its dimensions, the source of the image and also, importantly, who has the rights to the image. Knowing who hold the rights to an image as well as where the image is located is important for researchers because it provides guidance to the correct source for permission to reproduce the photograph. Now, the user has several options: He/she can print the image, save the image or examine it online; the photograph can be rotated or zoomed in and out. Online search engines like ARTstor can be a vital tool for researching and provides access to digital images of a wide variety of subjects. Whether you are looking for a specific painting by Edgar Degas or a photograph of a railroad station beginning your search with a reputable image search engine will provide you with the best quality and information. I hope that you find this basic tutorial helpful and happy searching! When I was a kid, one of my favorite things to do with my grandmother was to go through old photo albums and listen to her tell stories about the people and places in them. That was probably my first introduction to history, and it made it personal for me in a way that has shaped my view of the subject ever since. Historypin is an exciting tool that allows you to share your stories and photos with the whole world, and vice versa. The core concept is a map of the world, onto which members can “pin” photos, videos, or sound files, along with a date, location, and description or story. These items can be grouped in collections, around a single topic, or tours, where they are structured around a narrative. There are three basic ways to interact with the site—Exploring, Adding, or Curating. Explorers can search items geographically, chronologically, or by topic. You can also search via Google maps, and if the photo is a street view, you can superimpose it on the present day view. Anyone can explore, once you create a free account you can add and curate (create collections and tours). Account holders can also create their own channels, where everything they’ve added or curated can be found. The site isn’t geared solely towards individuals—Historypin also works with schools and local projects, in an attempt to achieve their goal of involving as wide an audience as possible. They also hope to encourage community feeling, spark inter-generational conversation, and conserve global archives, making them available to a wider audience and serving as a valuable resource for schools and universities. They are currently working with over 100 libraries, museums, and archives, helping them to reach a broader audience and experiment with new and innovative ways of sharing their collections. As a tool of public history, Historypin is admirable for several reasons. Firstly, it is incredibly inclusive. Anyone can sign up for an account and add their images and stories to the map. The site is easy to navigate, and uploading content is a fairly simple and enjoyable process. You can also personalize your channel, changing the color scheme, filling out an online profile, etc. It’s a process reminiscent of Facebook or MySpace, and I’ll admit it, it’s fun. This simple step makes the site approachable to non-academics; you can also link your channel to outside websites—blogs, Facebook, professional sites, etc. This ease of communication and connectivity is something that I think is really valuable in public history, and will only become more so with time. After all, who cares how great something is if no one can find it? As a historian, I find this tool quite useful, as long as its limitations and drawbacks are kept in mind. For example, if I’m doing a project on Irish families in Greenwich Village, I can use the map and search for images of those streets that I know from previous research were predominantly Irish. If I’m looking for images from a certain time period, I can adjust the timeline parameters. Check your sources—see who pinned the picture you’re looking at, and determine on a case-by-case basis if you trust them or not. Use your head—if something looks wrong to you, it probably is. Find another source and check it out. This is a great tool to get more people interested in history, as well as collecting content from around the world. It relates to people on a personal level, because they are photographs and personal stories, and because the average web-user can interact with and create the content. It’s useful, and it’s a lot of fun—go scope it out! Historypin was created by the self-described “behavior change” non-profit WeAreWhatWeDo in conjunction with Google. They did a beta-launch in 2010, and a subsequent global launch in 2011. Bon Marche, Eugene Atget. George Eastman House Collection. Maybe it was the late afternoon light. As I walked around the Village the other day with my camera in search of the past, I was drawn to surfaces. The shadow cast on red-orange brick by a black ladder, a white dog looking downbeat, leashed to the historic Beatrice Inn, and a haunting plaster face on a window frame on Charles Street, all inspired me to click the shutter. As I made the photographs, they made me think of Eugene Atget, and Berenice Abbott. They took me through the surfaces, and over eighty-five years into the past. Eugene Atget—one of the great photographers of the late-nineteenth and early-twentieth centuries, and one of the pioneer documentary photographers—about whom not many facts are known, was a former seaman and actor who photographed in and around Paris for three decades, beginning when he was around forty in the late-1890s. After focusing initially on making photographs for artists to use in their work (documents pour artistes), he soon shifted focus to the documentation of Old Paris, which was dying away. Atget made thousands of photographs of the city and its environs—beautifully detailed, realistic images of doors, storefronts, ornaments, ironwork, signs, reflections and street life. He sold his work to museums, libraries and historical societies, as well as to painters and theater directors. He worked alone, in the patient manner of the nineteenth century photographer, using a large format camera. By the time of his death in 1927, he was relatively unknown in photography and art circles, except by a small group of admirers that included young Berenice Abbott, who would go on to spend a lifetime championing his work. Abbott met Atget through Man Ray, the famous 1920s social photographer of Paris, who she worked for as a darkroom assistant beginning in 1923. Abbott had previously left Ohio at age twenty to live in Greenwich Village where she was involved with the Provincetown Playhouse, and tried her hand at sculpture, before following an exodus of artists to Paris in 1921. She excelled at photography and printing and left Man Ray to start her own studio in 1925, the same year she met Atget. She got to know Atget over the next two years, buying prints from him, and taking his portrait. She became fascinated with his work and when he died she bought half of his prints and plates. She took these with her back to New York in 1929 and soon grew obsessed with doing for New York City what Atget had done for Paris—documenting a city in flux, and one that had changed radically in the years she was gone, particularly through the building of enormous skyscrapers. Milligan Place, Berenice Abbott. 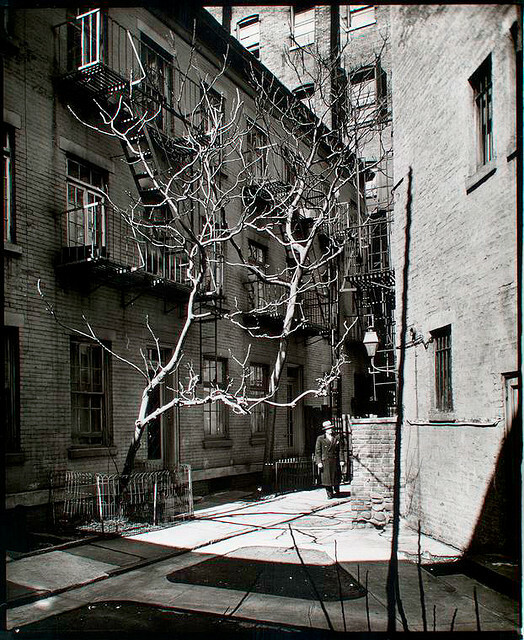 One of Abbott's photographs of Greenwich Village included in Changing New York. New York Public Library. 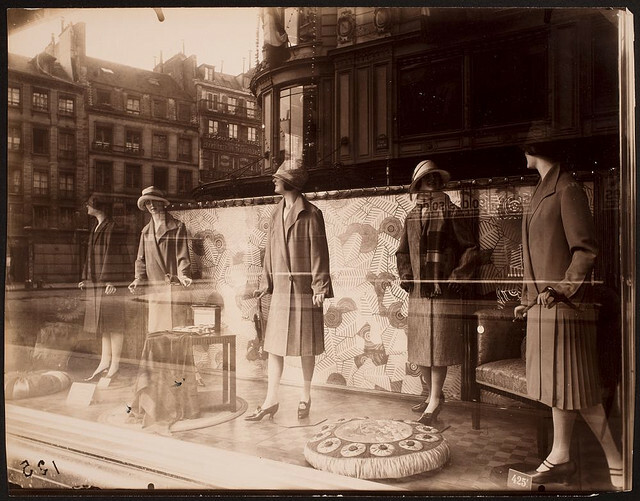 Abbott eventually found an outlet and a source of funding for her vision and in 1935 began to work for the Federal Arts Project of the New Deal’s Works Projects Administration to document the changing face of the city with the same type of camera Atget used. This work culminated in a 1937 exhibit, a book, Changing New York, and a collection of 305 prints, which are housed at the Museum of the City of New York. Abbott photographed across the city for the project but paid special attention to Greenwich Village, where she lived, at 50 Commerce Street. Her Village photographs for Changing New York, capture in a straightforward documentary style, the juxtaposition and layering of time and periods, the historical importance, mystery and plain charm of the neighborhood. Technically stunning and uniquely beautiful, they are essentially documentary in that they are concerned with time and place, with the passage of time and memory, and with the social landscape. They show the deep influence of Atget, perhaps more than the others, since Greenwich Village is much like Old Paris. Aside from making new work, and teaching photography at the New School in the Village, Abbott continued to promote Atget and search for a home for his work. In 1954, the Limelight, a coffeehouse and photography gallery, opened at 91 Seventh Avenue South. The owner was a young photo retoucher and passionate fan named Helen Gee, and she made Limelight—the only commercial photography gallery in the country—into a central space for the world of serious photography. 14-16 Gay Street, 2011. 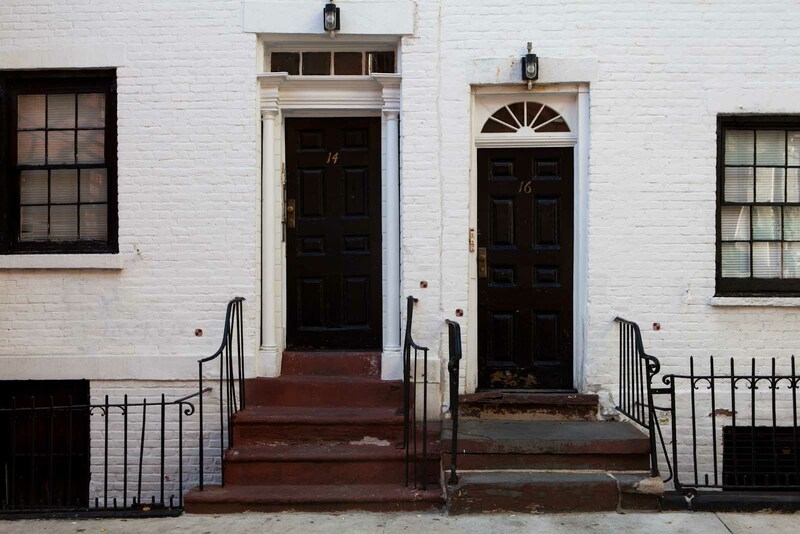 Abbott photographed these buildings for Changing New York. Photograph by Hanan Ohayon. The exhibit was a popular and critical success, and many of the prints sold—at twenty dollars a piece—an uncommon event at Limelight. It was the first time in twenty five years that an exhibit of the Abbott/Atget work had been shown. The Limelight closed in January 1961, after a seven year run, opening the door to many Downtown galleries, just as Eugene Atget opened the door for Berenice Abbott, and as Abbott opened the door for Eugene Atget, and as all of them opened my eyes. Gee, Helen. Limelight: A Greenwich Village Photography Gallery And Coffeehouse in the Fifties. Albequerque: University of New Mexico Press, 1997. Szarkowski, John. Atget. New York: The Museum of Modern Art, 2000. Worswick, Clark and Berenice Abbott. Berenice Abbott & Eugene Atget. New Mexico: Arena Editions, 2002. Yochelson, Bonnie. Berenice Abbott: Changing New York. New York: The New Press, 1997.